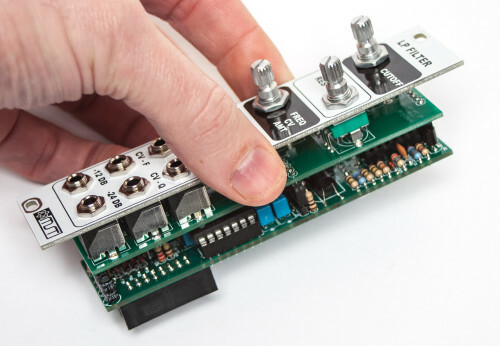 Thank you for purchasing the MST Low Pass Filter Eurorack module kit! This is an intermediate to advanced build and not recommended for the beginner since it has a lot of tight fitted parts, and stand up resistors. If you feel like you can handle it please proceed! If not, get some help from a friend with experience or purchase a fully completed unit. The MST Low Pass Filter has quite a few resistors that are flat some that need to be installed standing up. Let’s first install the flat mounted resistors. Populate first, then turn over on a firm surface to solder and then clip leads. Now populate the film capacitors as shown below. These caps are not polarized. Turn over on a flat surface to solder and trim. Add the two ceramic capacitors and the vactrol as shown below. 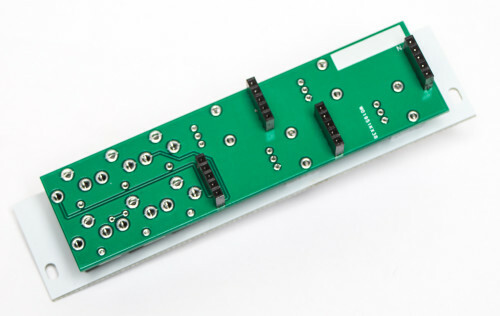 The Vactrol (opto-coupler) is a polarized component you must align the small white with the diagonal mark on the square on the PCB silkscreen. Now populate the remaining resistors which are easiest inserted if you bend one lead over first and align the body of the resistor with the circle marking on the pcb silkscreen. Carefully turn over to solder and trim. Next, make sure you orient the electrolytic capacitors in correctly. 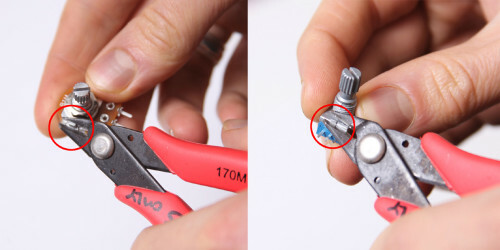 The longer lead needs to be inserted into the hole that has the “+” marking near it. Solder and clip. Next add the transistors by matching the flat side of the transistors with the flat side on the silk screen. Turn over, solder and clip all leads. Next add the 16-Pin Eurorack Power Connector in place by matching the key notch with the key indicator on the PCB silk screen. Next add the trimmer resistor as shown below and solder in place. 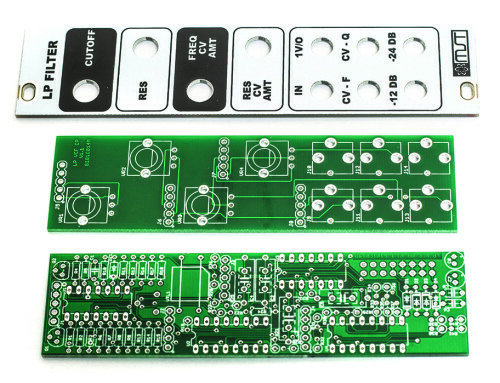 Place the ICs in place by aligning the notch with the notch graphic on the PCB Silk Screen and notch on the sockets. Congrats! You are now done with the MST LPF Main Board. We are now going to move onto the Control Board. Next up are the 15mm hex standoffs. We need to put these on before putting the panel on. Start by inserting the screw through the PCB from the front (the side opposite the headers) and screw the stand offs onto them from the back. Now PLACE (do not solder yet!) 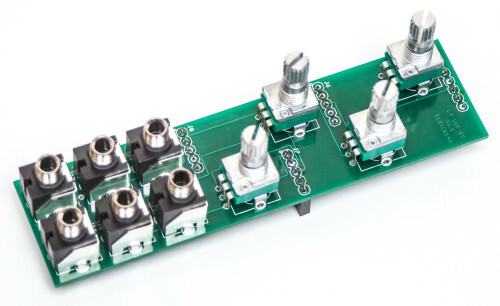 the jacks and the potentiometers in the circuit board as shown below. Now place the panel over the jacks and pots. Now fully tighten (not too hard) down the nuts for both the jacks and pots. Now carefully turn the board over and solder the pots and jacks in place. Next, carefully connect the two boards together via the headers. The standoffs should line up with the holes in the logic board. Take your 2.5mm screws, and screw them through the holes in the PCB, into the standoffs. 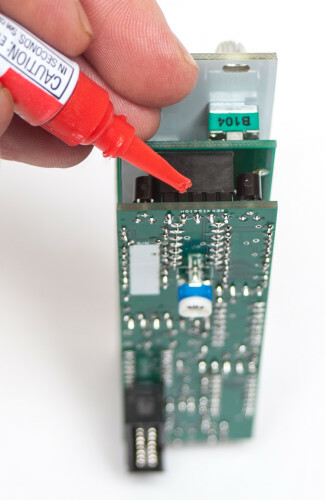 This will secure your module from coming apart. 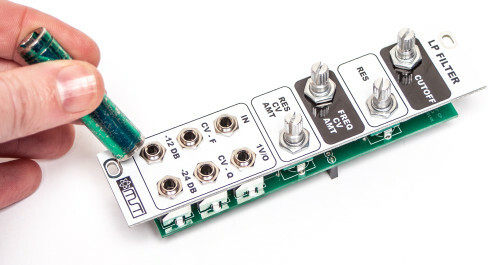 Plug your eurorack cable in, and you are ready for testing and tuning! If you purchased a MST VC LPF more than a few months ago, you may not have the version with stand offs. 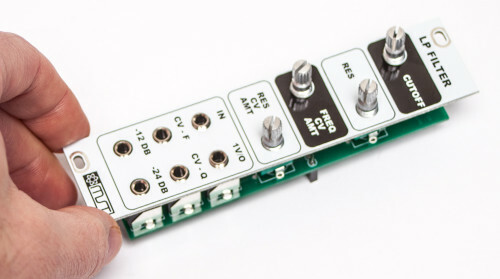 The headers may or may not be enough to hold it together, depending on if you travel with your eurorack setup. 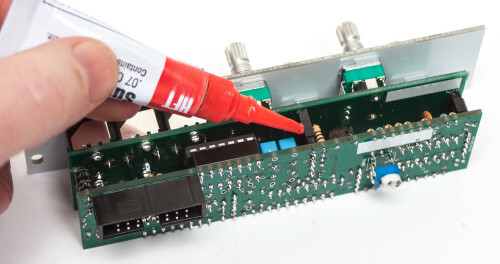 If you move modules around a lot, or travel with your system, we recommend gluing it together so it doesn’t come apart. Can we have some instructions for calibration, please! Hi David, we will have a simple instruction soon. But we have found that all of the ones that we have built are best calibrated by turning the trim pot all the way CCW. You could leave it in the middle to begin with, then choose C1 on your 1V/O source and tune the filter to C1 using a tuner. Go up a couple octaves and tune as you go along. You will probably end up with the trimmer full CCW. @Steve Harmon Thanks, Steve. That’s very helpful. I put together this kit and it is not working at all. I checked my solder joints. They look good. I’m super bummed. I also built the LFO and it works great! So I know the power supply is aight. All diodes and chips are in correctly. Any tips? They need to be Linear taper for it to work properly. can i use a 1n757 for d 21? how important is it to use a 1n751? Unfortunately that will not work, it is necessary to use a 5.1V Zener diode. Is there a schematic available? I put together the kit and unfortunately no joy, checked components and solder points, I may have damaged the board but it’s hard to follow all traces a schematic would be great! Unfortunately, due to different licensing agreements, we are not able to make all of our schematics available to the public. We also offer repair services for kit builds and totally free troubleshooting help through email! Is 1n4733 a possible substitution for the 1n751 zener? I have a ton of those and none of the other. I looked into your question a bit and from what I gathered, you can use 1n4733 as a substitute. However, I have no personal experience with how this may alter the sound of the module. you should consider ditching the super glue idea. i have never seen anyone else use that method. adding screws + spacer would be a LOT easier to maintain. Is the BOM identical in value and place ? For the MST Low Pass Filter Resistor R14 on the Bill of Materials is 200k Ohms while in the photo R14 is 220k Ohms. Going with the Bill of Materials as I wasn’t shipped a 200k Ohm Resistor with this kit. Have yet to get it to work. Tested everything with a Multi-Meter and everything seems fine. The only thing I imagined I messed up were the ICs so I ordered 4 new ones along with 2 x 14-pin & 2 x 16 pin sockets. hello, my filter did not work, the only piece for which I have doubts is the vactrol, the only model I found in my country is the vtl5c, should this work? Hi Rodrigo, I would still recommend replacing this with an NSL-7053. It’s response is different from the VTL5C series.